Thorpe Park has reopened its ‘Saw – The Ride’ rollercoaster, which had remained closed since the Smiler crash at Alton Towers last month. The Gerstlauer-manufactured ride reopened to guests of the Surrey theme park this afternoon. It was previously closed by operators Merlin Entertainments as a precautionary measure following the accident on 2 June at Alton Towers. It is understood to not have been related to the enforcement notice issued by the Healthy and Safety Executive preventing the Smiler rollercoaster’s use. 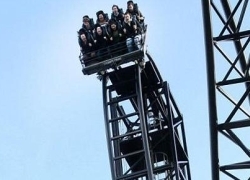 Gerstlauer rollercoasters at other UK theme parks remained open following the accident, which seriously injured five people and hurt a further 11. The Smiler has remained closed since the Alton Towers crash, and is not expected to reopen before the end of the Staffordshire attraction’s 2015 season.